a) your looks and how smart you are. b) what you think and believe. 2. What we think determines what we do and how we feel. 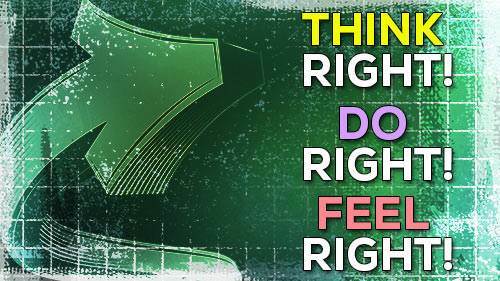 a) do right things and have right feelings. a) we have right feelings. b) we have wrong feelings. a) they believed Satan's lie. b) they didn't know any better. a) to put wrong thoughts into our minds. b) to put right thoughts into our minds. a) that He loves and respects only certain people. b) that He loves and respects every person. a) thinking right thoughts and making right decisions. b) doing what everybody else is doing. a) from television and from our friends. b) from God and from God's Word.